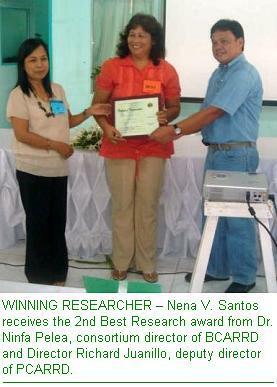 Nena V. Santos, science research specialist I of the Catanduanes State Colleges (CSC) Research and Development Services was adjudged 2nd best researcher in the 19th Regional Research Development and Extension Highlights conducted by the Bicol Consortium for Agricultural Resources Research and Development (BCARRD) on July 27, 2007 at Bicol University College of Agriculture and Forestry in Guinobatan, Albay. Santos’ winning research work is titled Morphology and Some Ecological Characterization of Pangi Parartocarpus woodii Merr which she extensively conducted by mapping out and investigating the characteristics and potentials of a rare tree specie found in the northern part of Catanduanes and in some places in the country. The study focused on the botanical features of the tree locally known as Pangi, documenting its leaves, twigs, fruits and seeds, identifying areas in Catanduanes where pangi is abundant and characterizing some ecological aspects where said tree thrives. Eleven researches from 20 agency members of BCARRD composed of state colleges and universities in Bicol and regional and line offices of Department of Agriculture, DENR, DOST, NEDA and other agencies in the government’s social sector participated in the research forum. Entry filed under: BCARRD, Completed Researches, Nena V. Santos, Pangi, Regional Research Forum. Author of best undergrad thesis is 4th place in agri licensure test	Check out our new website! July 21, 2007 Lynn's Birthday Party!! !